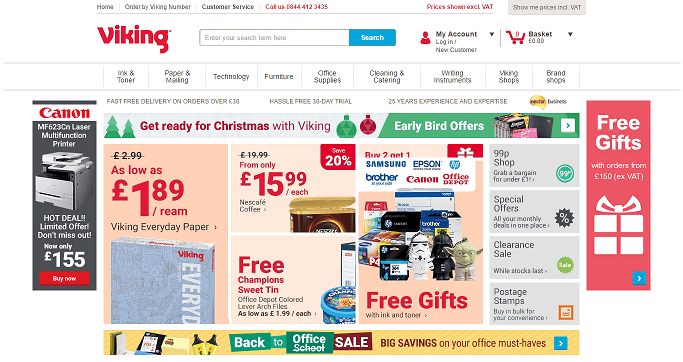 Sign up for free and just shop with Viking as normal. Our members earned £60,000+ at Viking in the past month. Gift card purchases are excluded from cashback. Viking cashback can be earned simply by clicking through to the merchant and shopping as normal. Viking Cashback is available through TopCashback on genuine, tracked transactions completed immediately and wholly online. Cashback not available on Apple products. Make great savings when shopping online with the company which sells more office supplies than any other in the UK thanks to our Viking voucher code and cashback deals. As part of Office Depot, they can ensure you will find thousands of products at great prices, whether you are buying ink and toner, technology, cleaning products or writing instruments. They offer fast and free delivery on UK mainland orders over £30 (excluding VAT), while they will collect your order free of charge within 30 days if you are not 100% satisfied with it. They provide a free pro-fit office furniture installation service wherever you see the logo, while you can claim a free gift with orders from £30 (excluding VAT). Viking has all the inspiration your office needs! You can save money on a huge selection of products from leading brands with our Viking discount code deals. You can search for ink cartridges or toner by printer make and model or cartridge number, no matter if you are buying for Lexmark, Brother, Canon or Epson printers, while they also offer paper and mailing essentials. When it comes to technology, you will discover laptops, tablets, phones and accessories such as network cables by the likes of Apple, Samsung and Acer, while Viking also sell GGI office chairs, Letts stationery, Pilot pens and Office Depot sign holders. Before visiting the Viking website, however, sign up to TopCashback using the form at the bottom of this page so you can make savings. If you order regularly with Viking, you can create different shopping lists if, for example, you buy for different departments. You can have as many shopping lists as you like to make life easier for yourself when it comes to ordering, while it is also possible to set up a reminder email and receive an alert on your chosen day. Once you have created your lists, go to 'View all lists' to see an overview of them. As well as being able to create a new list, you can also delete saved ones. To add an item to a shopping list, just go to the item and click on '+ Add to Shopping List'. No matter what you purchase using our Viking discount codes, they offer free UK mainland delivery on orders over £30 (excluding VAT). For certain postcode areas, they can deliver the same day if you place your order by 10am Monday-Friday. For other areas, order by 6pm Monday-Thursday and you will receive your items the next working day, while orders placed after 6pm on those days will arrive two working days after. Orders placed before 6pm on Friday will be delivered on Monday, while if you order after 6pm on Friday, or on Saturday or Sunday, delivery will take place on Tuesday. You can enter your postcode on the website to check delivery times for your area. All items will need to be signed for and if you are not in, their carriers will attempt to deliver on three consecutive days. Furniture deliveries to UK mainland addresses will arrive within five working days, while if you see a truck icon by a product, it means it will arrive directly from the manufacturer and will take longer. For selected lines of furniture, they will deliver and set it up for you at no extra cost. If you need to return an item bought using our Viking promo code deals, you can do so within 30 days of receipt, though you will need to contact the customer services team to arrange this and order an alternative, if required. They will arrange for collection the next working day and the driver will provide a returns label, meaning you will not have to put the address on the package. However, you must ensure the item is securely packaged and you enclose the packing slip or a copy of the invoice. Once they have received the item, you will be refunded, including the delivery charge. You should also contact the customer services team if you receive a faulty item, or you have been sent the wrong product. You will not get a licence to print your own money, but you will make great savings with these cashback and voucher code deals if you are shopping for office supplies. Viking offer an extensive range for both home and business use at fantastic prices. Their range includes everything from ink cartridges from leading brands such as Epson and Canon, to a wide selection of office furniture and chairs. You can also shop for stationery and other office essentials, including electricals like PCs, laptops and tablets. Take up one of our offers and get a discount on labels, envelopes and cleaning products, while Viking offer free delivery on orders over £30.